We’ve all sat through a meeting or presentation where speakers read from copy-heavy slides, losing our attention and leaving us to nod off into our coffee cups. While death by PowerPoint is a real thing in many corporate settings, a shift is underway. Recently, the CEOs of Amazon and LinkedIn banned PowerPoint presentations from executive meetings, opting instead to share stories in more engaging ways. At Ink Factory, we’ve seen this change firsthand across industries like tech, health care and education, and in settings ranging from meetings and conferences to trade shows and employee trainings. Presenters and audience members alike are demanding new ways to share ideas and engage with one another. So, if PowerPoint is out, then what’s in? The alternative is something that’s created alongside a conversation—that’s more visually appealing and helps people better understand, process and remember information. Artists create visual notes (sometimes called graphic recordings) by listening to a speaker, filtering for key concepts, then drawing those concepts using images. Visual notes are drawn live while the audience watches, resulting in a documentation of the discussion. The rise of infographics, online video and social media didn’t happen accidentally. Humans are naturally drawn to visuals—we evolved this way. In fact, our brains process images 60,000 times faster than text and audio. So, when you pair live drawing with a live event like a meeting, brainstorm or presentation, you set the stage for more productive learning and collaboration. Science points to four benefits of visual notes. For starters, they’re more accessible. This is because the majority of us are visual learners. They also improve our ability to understand and recall complex information, which makes sense because humans remember 80 percent of what they see, but only 10 percent of what they hear. And, perhaps most importantly, visuals forge emotional connections with viewers. When this happens, people are more likely to engage with the content, remember it and take action. PowerPoint slides are one dimensional, reflecting the speaker’s point of view. They rely on the speaker to organize his or her thoughts visually (a daunting task for many presenters), and they don’t capture the conversation that unfolds during a presentation. Visual notes accomplish both, making them a more engaging format both during and after an event. Once complete, visual notes can be photographed and shared as digital files. This makes it easy to repurpose them in creative ways. Companies have transformed visual notes into office wall art, printable PDFs, Plexiglass replicas and other promotional items. For example, Purdue University published a book that includes visual notes from each talk at its annual Dawn or Doom conference, and Charles Schwab turned visual notes from an event into artwork for a tote bag that was sent to attendees. Live events come in many shapes and sizes, and luckily, visual notes can complement just about any of them. Analog visual notes—those drawn on artist boards using markers—are ideal for smaller, more intimate settings like meetings, brainstorms and strategy sessions. When an audience watches an artist live drawing next to a speaker, attendees can listen to the content and see it come to life simultaneously. One example of this is when Whole Foods recently hosted community meetings in cities where it was opening new stores. The retailer documented the community’s feedback using visual notes. 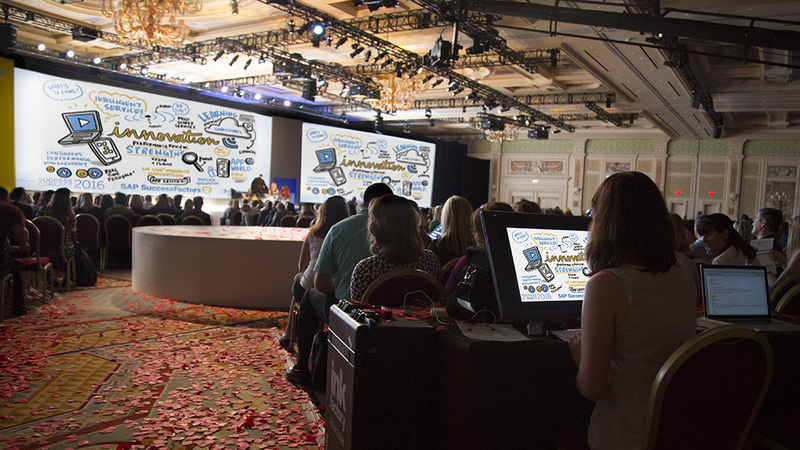 Large-scale events like sales meetings, conferences and trade shows lend themselves well to digital visual notes. These are drawn on a digital tablet and projected onto screens throughout the event space, making it easy for attendees to follow along. Companies can get creative with materials and settings as well. For example, employee benefits company Maestro Health designed its trade show booth with visual notes in mind. The booth was comprised of backlit LED panels where an artist captured visual notes from the conference. Attendees also could download digital notes right from the booth, creating a compelling call to action. There are endless creative possibilities when it comes to displaying and engaging with visual note-taking, and the benefits are strikingly clear. When people can visualize a talk, they remember it. Ink Factory is a team of artists who use visuals to help organizations solve problems and engage audiences. The company works with non-profits, government agencies and Fortune 500 brands alike from around the world. Visit inkfactorystudio.com or get in touch at hello@inkfactorystudio.com to learn more. Lindsay Wilson is an artist and co-founder of visual note-taking studio Ink Factory. Born in Germany, raised in Texas and now living in Chicago, Wilson brings an entrepreneurial spirit, levity and humor to the studio and her client work. Most recently, she was named a finalist for the Sharapova Women's Entrepreneur Program, an initiative led by NAWBO and tennis champion Maria Sharapova that provides successful female business owners with resources to continue growing their businesses.